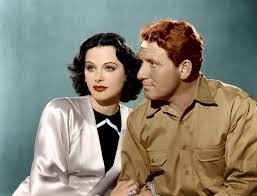 Spencer Tracy is best known for his on and off-screen partnership with Katharine Hepburn, but during the 1940s he made three films with our Star of the Month, Hedy Lamarr. Lamarr and Tracy's partnership didn't produce any enduring classics like Adam's Rib or Woman of the Year, but all of their films are solidly entertaining. We'll take a closer look at them after the jump. 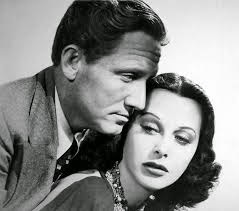 Spencer Tracy plays an idealistic doctor in love with Hedy Lamarr in I Take This Woman (1940). This soapy melodrama features Lamarr as a beautiful socialite who tries to jump off a cruise ship after her affair with a married man (Kent Taylor) goes sour. 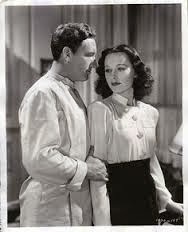 An idealistic doctor played by Spencer Tracy saves her and falls in love at first sight. They marry and predictably he works his fingers to the bone while she grows bored and attempts to reunite with her old flame. The film had a notoriously difficult production. Its first two directors, Josef von Sternberg and Frank Borzage quit, leaving W.S. Van Dyke to complete the film. I Take This Woman was a flop at the time, and it doesn't really hold up that well today. The highlights are MGM's always high quality production values and the supporting cast, particularly Verree Teasdale as Lamarr's tell-it-like-it-is friend. DVD. Boom Town (1940, dir. Jack Conway). Hedy Lamarr gets her claws into Spencer Tracy in Boom Town (1940). I already covered this film in my look at Lamarr's top five films. This film and Samson and Delilah are my two favorite Lamarr movies. She and Tracy work well together her, but it is the chemistry between Gable and Tracy that makes this film exceptional. DVD and video on demand. 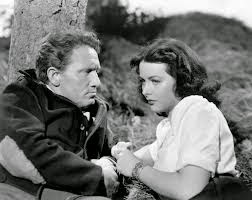 Spencer Tracy and Hedy Lamarr play Mexican immigrants in Tortilla Flat (1942). Tortilla Flat is probably Lamarr's best remembered film today. The film is based on John Steinbeck's novel about a group of poor Mexican immigrants living in a California fishing town. The accents are atrocious, but otherwise the film is quite good, especially the performances of John Garfield and Frank Morgan. Lamarr plays a beautiful cannery worker who wins Garfield's heart. DVD.